Mountaintop Repeaters and Fixed station repeaters provide a stable platform for long-term, long distance coverage using higher than normal power output and fixed station antennas that are usually mounted on a tower, or atop a building. Most common mountaintop repeaters operate from a stationary power generator, or solar power, as the case may be. In many instances, mountaintop sites are built in "Out Buildings" or communications shelters, including shipping containers to protect the equipment from the elements. 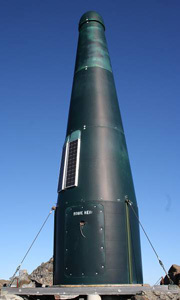 We also sell communications shelters manufactured by Sinclair. At Timberline Radio Systems, we design, build and maintain mountaintop repeaters at facilities throughout Canada, USA and South America. 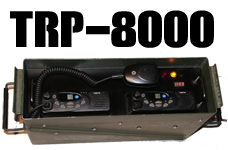 Call us for help or support with your mountaintop repeater system. Servicing all makes and model including TAIT, Kenwood, Icom, Daniels & TU Wolf. To the right is a photo of a common mountaintop repeater built in a secure "shack" used for commercial communications. Onsite same day service throughout British Columbia, Alberta, Yukon & Alaska.